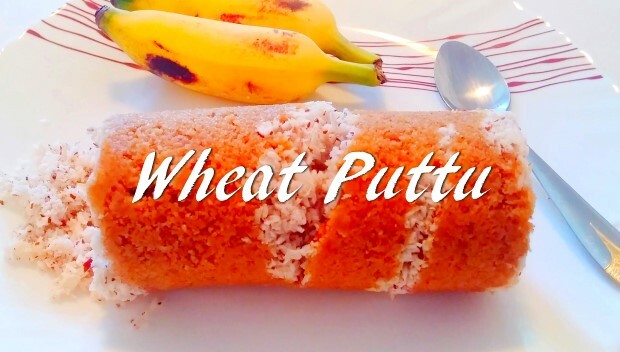 Here comes the healthy delicious breakfast recipe Wheat puttu. This Gothambu puttu or soft wheat puttu is a steamed non-fat dish and made with whole wheat flour and shredded coconuts. Everyone in my family loves puttu and its a regular weekend breakfast with a combo of kadala curry or any spicy chicken curry. This traditional kerala dish can also be made with rice flour. So, lets see how to prepare this healthy dish with simple video recipe! Spriinkle water little by little and knead to sticky consistency. The batter consistency should be moist as shown in video. Grate fresh coconut to fine shreds. Now take the puttu maker mould, add 1 to 2 tbsp of grated coconut. Then add 3 tbsp of wet wheat flour on top of it. Add alternatively grated coconut and wheat flour until the mould is filled. Now close the lid of mould. Meanwhile heat water in pressure cooker. Place the puttu maker on the pressure cooker nozzle or vent. Let the puttu steam cook for 10 to 12 minutes. Turn off flame and let it cool. Open the lid and insert a skewer from the backside of the puttu maker slowly. Flavorful, healthy and delicious wheat puttu is ready. It makes an excellent combo with kadala curry, pappad and ripe bananas.